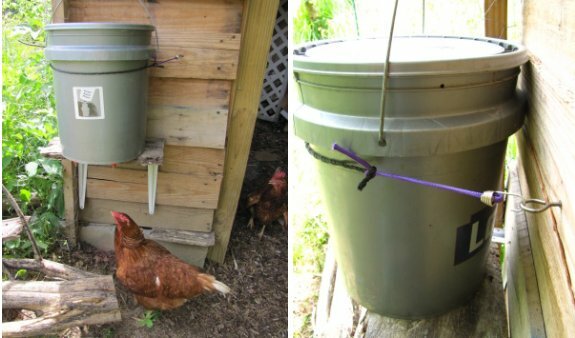 I decided my previous 5 gallon automatic waterer bucket holder needed to be simplified. 2 shelf brackets, a piece of scrap lumber, and some rope with a bungee cord tied on the end seems to do the job quite nicely. I like the simplified design and already have my Lowes bucket ready. Aquamiser parts should be here soon . . . can't wait! Thanks for keeping the Walden Effect running, Jeremy!